Wild and free! Beneath your feet, in gardens, reserves, along waterways and roads, you will find a whole world of wild edible leafy greens. 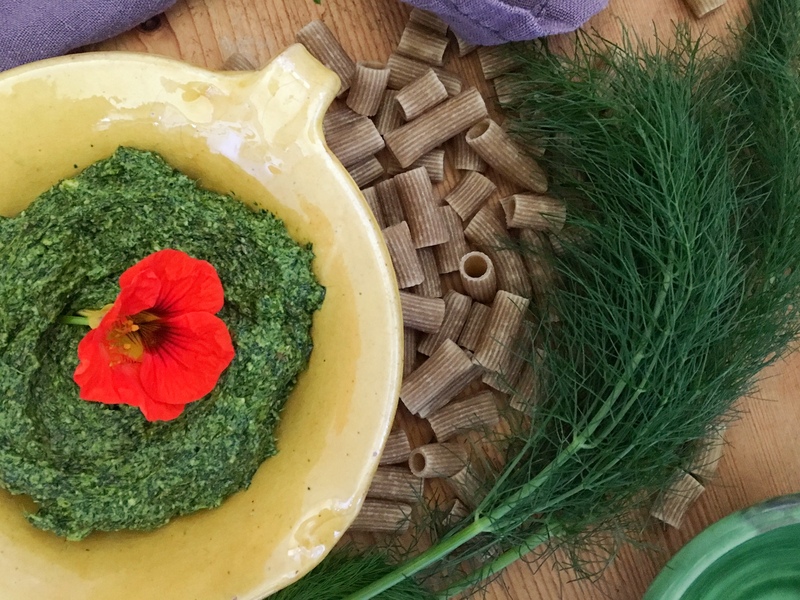 What better way to celebrate all this spring goodness than with fresh pesto? For the pesto in this post, I used wild fennel and watercress. Both foraged on walks around our local rivulet. Other edible “weeds” you might find in spring include stinging nettle, watercress, rocket, wood sorrel, sow thistle, ribwort/plantain, mallow, pig face, fat hen, chickweed and Warrigal greens. The list is almost endless, and the region where you live will have its own selection. You do need to be cautious, 100% sure of what you are picking. You could poison yourself inadvertently … yes, seriously. I keep a couple of foraging books in a cloth tote bag in my car glove box. They contain both photos and line drawings so I can be sure of what I am picking. A couple of good books are The Weed Foragers Handbook: A Guide to Edible and Medicinal Weeds in Australia by Adam Grubb and Annie Rowland and The Wonderous World of Weeds by Pat Collins. I also carry a pair of chicken shears that pull apart; you can also use them as knives. Super handy and more versatile than secateurs. If you poke around online, you can also find some great resources. Here in Australia, I like the guides on the ABC website and the SBS website. If you are in Tassie, this is useful too. A quick internet search will help you find resources that are specific to your region. After a season or two, you should be able to identify the most common edible greens in your area. Self-education and education of others is at the core of respectful foraging. “Locally the most common food waste may be wild edibles. In Spring, our local hills are completely covered with different types of mustards, mallow, wild radish, chickweed … probably hundred of tons of edibles leaves, roots, seeds and flowers. Food for thought, literally! Observations that apply globally. This recipe is not a traditional pesto; it would probably make a nonna purse her lips and roll her eyes. Even so, wild green pestos are great at capturing the flavours of spring and adding a nutritional punch to your day. You need a LOT of leafy greens to make a small phytonutrient-dense jar of pesto. A little goes a long way. The pesto really does showcase some of the beautiful peppery and aromatic greens. Peppery greens you might find are rocket, watercress and nasturtium. 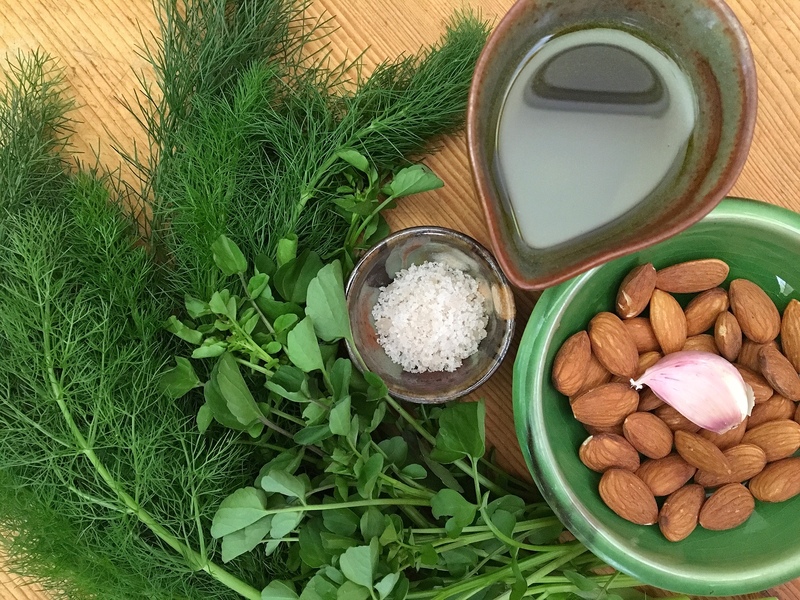 More aromatic greens include fennel and other traditional culinary herbs. Peppery and aromatic greens are great to mix in with more bland greens such as chickweed and mallows or bitter greens such as dandelion, to boost flavour. How can you use wild green pesto? I am sure you are going to come up with a few uses of your own. Share them in the comments at the end of the post. I am always looking for new ideas too! Make hay while the sun shines … fragrant herbs are so abundant in spring, make a stash of pesto and preserve it for winter. The easiest way is by freezing the pesto in ice cube trays or silicone muffin trays. When frozen, release the cubes and store them in a container in your freezer. There they will sit until the colder months, ready to add to soups, stews, baking and other winter meals. There is nothing like a bright, fresh taste of spring in the middle of winter! Place greens and nuts/seeds in a food processor. Pulse several times. Scrape down sides of the bowl with a spatula. Add garlic and parmesan to bowl. Pulse several times and then scrape down the bowl. Restart food processor and add the olive oil in a steady stream while it is going. When the pesto is at a consistency you like stop the machine. You can add more oil if needed. Use a spatula to transfer to a clean jar, secure cap and rergierate. Keep your pesto green and fresh by adding a thin layer of olive oil to the top before refrigerating. Refrigerate for up to a week or freeze into cubes for future use. This recipe is a guide only, experiment with the greens and proportions of the other ingredients until you find the combinations you love. Tip from me: remember to write your own recipes down, it is so easy to forget before the next spring. Enjoy your wild greens spring pesto!